The end of the year is quickly winding down and my visits to the river have all but ceased. Every year in December, I soothe my lack of water time with reflections of a year spent living my life as I’ve designed. The experiences I’ve had really come into focus and I start collecting on all my roll over memories until Spring comes. I’ve stock piled a ton of fly fishing adventures this year that haven’t been documented here on this old blog of mine, but rather than talk fish, what I really feel compelled to write about is the people I had the privilege of Fly Fishing with this year. All of them. While I wander the online world of blogs, people and fly fishing community, I’m always curious about the person behind the computer screen. I think we can get a general ‘impression’ of what a person is like through their written words and photos, but one never knows how well preconceived notions will match up face to face. For all the people I’ve fished with this year, yes, this means I’m going to write about you. Today, I’m putting just one person on the spot. I think there’s a general rule out there when it comes to fishing with someone. You get one shot and if you don’t jive together, chances are you’ll never fish with them again. Chris and I musta passed the mutual test…(despite showing him my bad side the first time)…because we fished again this summer during the Trout Unlimited Yellowstone Blogger Tour for a solid week. Chris is the National Director of Communications for Trout Unlimited, and he writes the Fly Fishing blog Eat More Brook Trout. 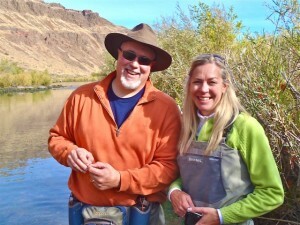 He authored the book Shin Deep: A Fly Fisher’s Love For Moving Water. 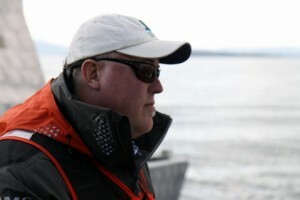 Chris also travels the world promoting Conservation, he goes to Washington D.C. to advocate for causes and he seems to know just about everyone and more in the Fly Fishing Industry. Someone: Were you nervous or intimidated fishing with Chris considering all the influence he holds in the Fly Fishing world? Me: Umm… I guess not, he just seemed like a regular guy to me. Someone: You do realize a ton of guys would give up their best fly rod to spend a whole day on the river with him, right? I suppose the reason I didn’t realize the influence Chris had in Fly Fishing is because you’d never know it from talking with him or hanging out with him. Maybe he is the Peter Parker/Spiderman of the Fly Fishing world and he just knows how to handle the ‘with great power comes great responsibility‘ with grace. When I fished with Chris this summer, my first impression of him remained. 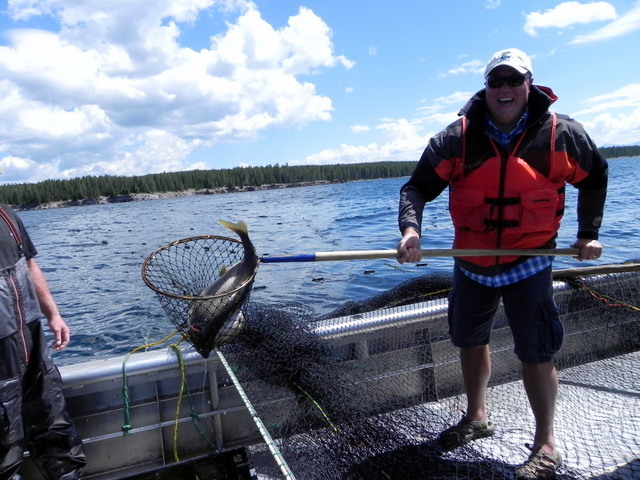 He’s just a regular guy who is passionate about fly fishing, conservation and connecting with like minded individuals. No ego, no airs, nothing to raise an eyebrow at…if anything, the only thing larger than life about Chris is his size and personality. At around 6’5″ with a dose of fantastic charisma to match, he can charm a room full of guys and gals. He has a great sense of humor and a belly laugh that is contagious. If you ever get a chance to fish with Chris, be sure to bring your A-game in jokes because he loves a solid punch line. 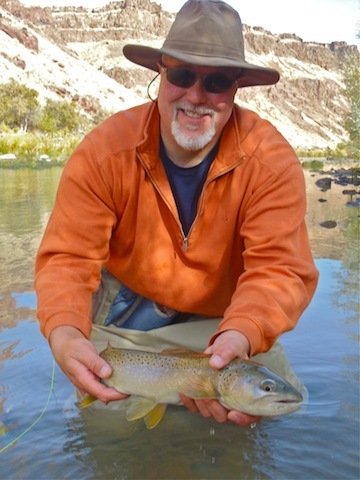 For all Chris’s worldly fishing experiences, connections and alike, what people might not know about him is that he enjoys fishing alone, exploring tiny off the beaten track streams and creeks. His close proximity to Yellowstone gives him plenty of water to explore and this summer while we were driving around, I don’t think we passed a piece of water…3 feet wide to 30 feet wide…that Chris didn’t point out and tell us how it fished. I’ve really enjoyed getting to know Chris over the last 2 years. I’ve fished in tight quarters with him where we’ve chatted it up between casts and I’ve spent an entire afternoon with him working our way up a stream hardly speaking at all. If you get the chance, I highly recommend spending the day on the water with Chris. Thank you Chris, for everything. I’m hoping to get a chance to finally meet, in person, and fish with, this Chris Hunt character of whom you speak. He looks tall. He is indeed tall Kirk. Chris seems awesome. I prefer to fish alone but when I do bring someone along on my adventures, I make sure we get along first otherwise it can be a nightmare. I’ve seen Chris’s name around the interwebs and I’ve got his blog on my reader. Seems like a great guy and I hope to run into him one of these days in person. Thank you Rebecca for sharing your insights about the man behind the scenes. You’re welcome and I hope you get the chance someday. A good man. And he has a fantastic memory. Never let’s you forget stuff. Especially things you utter at breakfast after four days without a sip of scotch. Isn’t that another sign of a good friend? Someone who remembers the finer details and reminds you of such moments? Time spent with Chris Hunt is time well remembered. You did a great job of capturing his fine qualities. If you can’t fish with him then a dram of Irish whiskey is not a bad plan B your readers are well advised to not pass up any opportunity to enjoy his company. Thanks Tom. I could have gone a few more paragraphs about his finer and funny qualities…and I agree, don’t pass up the opportunity if you get it to hang out. Plan A or Plan B! BTW Chris, we have a bevvy of Longhorn ladies with lots and lots of spandex lined up to meet you next time you come down to Texas for a redfish foray…. Sorry Mark! It must be the Christmas season, I’m feeling all soft and sweet. Maybe Chris won’t even notice this post and he’ll never know about this rave review. Well Rebecca, Chris seem like a fine older gentleman…spry for his age. But I was really hoping you’d spotlight Kurt Weiner. Now that guy’s funny. True that Howard. My first impression of Chris…via avatar online…had him coming in between 65 –80 years old. But after meeting him in person I gotta say, he carries it all well and wades a river like a mid 40′s kinda guy! Kurt Weiner is not a real person, therefore one cannot actually fish with him. In this day and age of virtual realities, he is little more than a cardboard cutout. And let’s stay on track and keep this about the guest of the week, Chris Hunt. I guess I forgot to say that although I have never met Chris, I have the utmost respect for the job he does keeping all of us posted and updated on so many important issues and bringing people together to discuss them. I actually date a brookie this year on behalf of Chris. In Illinois, I’ve been a TU member for over a dozen years and there are no trout in Illinois and I don’t go looking to fish for them. We have smallies and I live two blocks from a river. Why travel? I have tried to apply the TU ethic conservation to the rivers and streams around here, but it’s bass. Ever try to get bass anglers to quit talking about hawgs and get involved? Doesn’t go very well and it doesn’t make you a lot of friends. 2 blocks from a stream would get me into trouble. I am truly flattered and … speechless. And for me, that’s rare. Thank you, Rebecca, for the kind words… I’m grateful. You’re welcome Chris and I’m glad we crossed paths in this small world. It’s been a true pleasure my friend and I look forward to future fishing trips. I was a bit confused myself about the whole, Save the West, Eat a Brookie thing at first, but once I had Chris explain it to me and learned more about conservation I understood. Chris? Care to explain again?? Being a blogger myself I agree with what you have said about Chris even though I have not gotten a chance to fish with him yet. Hopefully soon though. Keep up the amazing work girl. I hope you get that chance soon Graham, he’ll leave a lasting impression. As a colleague of Chris’, I think this is just a complete load of crap! Working and fishing with him is well…. well… OK it is really awesome. Chris is a super talented guy and we at TU are lucky to have him and the world and our favorite trout streams are all the better for his efforts. @ Rebecca — thanks to you too for all your excellent posts and contributions to making the trout fishing world a better place all around. We need more of you! But I’m glad you fessed up in your comment about Chris’s finer points and you’re right…we are all better off because of Chris’s efforts out there. I should have mentioned in my post how much I’ve learned from Chris over the last couple of years when it comes to Conservation. For that I’m REALLY grateful. I think many of us have said “Mother Chucker” a time or two on the water. You should hear me after I go to set the hook and the fish spits it then my line goes into a tree branch above me. You’d think I was preparing for Def Comedy Jam. I agree on your mention of a fishing buddy… if you don’t enjoy the company of your fishing buddy it’s not likely you will want to go back with them again. Fishing is suppose to be relaxing and fun at the same time and if you have the wrong person with you it can lead to frustration. Glad to see this wasn’t the case for you! I personally enjoy fishing by myself, although no doubt would learn a lot fishing with someone like Chris. The experience you would gain is priceless but then again all to their own. Nice post Rebecca. Maybe one day I will fish with Chris. What an cool guy! You really can’t beat fishing with someone really talented, It’s like a bit of their awesome rubs off onto you if you take tips and learn from them!